Wreck-It Ralph 2 - Fun Bun Pancake Bunny Pop! Vinyl - FunKo Free Shipping! 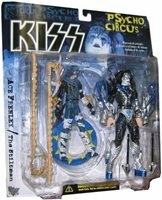 McFarlane Toys KISS Gene Simmons (#2) Ultra Action figure, with letter, New! McFarlane Dragons Series 3 Berserker Clan Dragon Figure !! !